So what's the difference between a good Help Desk / Customer Service platform and the Help Desk module of a fully integrated relationship Life Cycle Management solution? Glad you asked! rave7™has a best-in-class integrated Help Desk. Not an add-on or simple, module, but a full featured system that has all you'll need to manage your support center. The functionality is vast, and the form fields are 100% customizable right down to the database level. The case type fields allows you to create/use completely different forms based on the case type. rave7™ is one of the most feature-rich help desk products available. 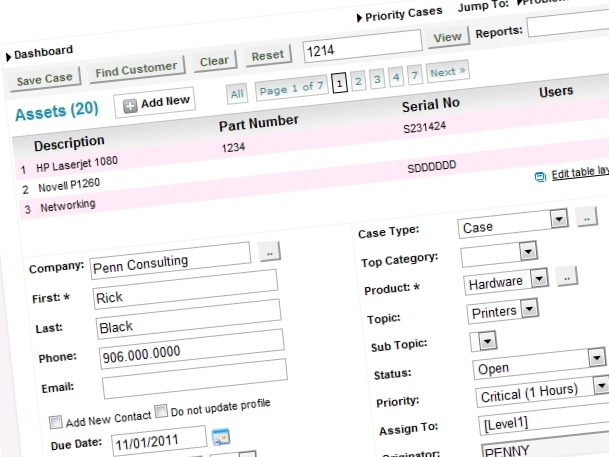 All of our help desk screens are 90-100% customizable. • Supports MS-Access, Oracle, SQL Server, MY-SQL, Sybase etc.